Hello everyone, the UPS man figured they forgot half of my order today because of how light the box was, but it actually had four new knives that I could not pass up! There were actually six in there, two of which are gifts for my father. But here's what I got, I'll go my favorite to my least favorite and these are just first impressions. 1) Cold Steel Finn Hawk 2) Hultafors Heavy Duty GK 3) Mora Companion Heavy Duty 4) Mora Kansbol. My father will be receiving the a Cold Steel and a Hultafors which are the same things as the ones I got. A few things I really like about the Cold Steel are, the knife and sheath are tight, definitely will not wiggle out while on your belt no matter what you're doing, actually kind of looking forward to getting it worn so its a bit easier to get out. The handle is absolutely fantastic, it reminds me a Hogue over mold, one of those type to not slip even when wet. The blade is thick and brawny and razor sharp, but it has the proper sharp for intricate work. Truth be told the Hultafors and Companion are kind of tied, the Hultafors has a horrible handle in the respect of material used, it's a hard plastic that needs some help from my soldering iron to get some texture, on the other hand it is a big rugged handle. I do not have exceptionally large hands, but I do wear an XL size glove and at times I feel like a knife can really suffer from a small what I call a ' boy's handle '. The Hultafors though has a thick blade, seems like it would be a fantastic knife for using and abusing and it keeps going. Has good heft to it. The Companion has a fantastic handle, it's large like the Hultafors yet has the Cold Steel's gripping ability, one thing I immediately noticed was there was not much heft to it. Maybe I will change my mind on where it stacks up compared to the Hultafors after riding on my belt for 12-16 hours at work, but I doubt it. Last and very least in my opinion is the Kansbol, my favorite thing about this knife is the sheath... the outer part of the handle is nice and offers a good grip, but the middle is hard plastic with a bit of checking. Sticking on the handle it will certainly need work done before I use it, because there is hardly anything from stopping your finger/hand from slipping up into that blade. It is this round good sized handle, but just not something I like, will certainly be modifying it. Another point I am going to bash on is the blade, I understand the tip is supposed to be used for finer work thus it is thinner, and vise versa for the back. 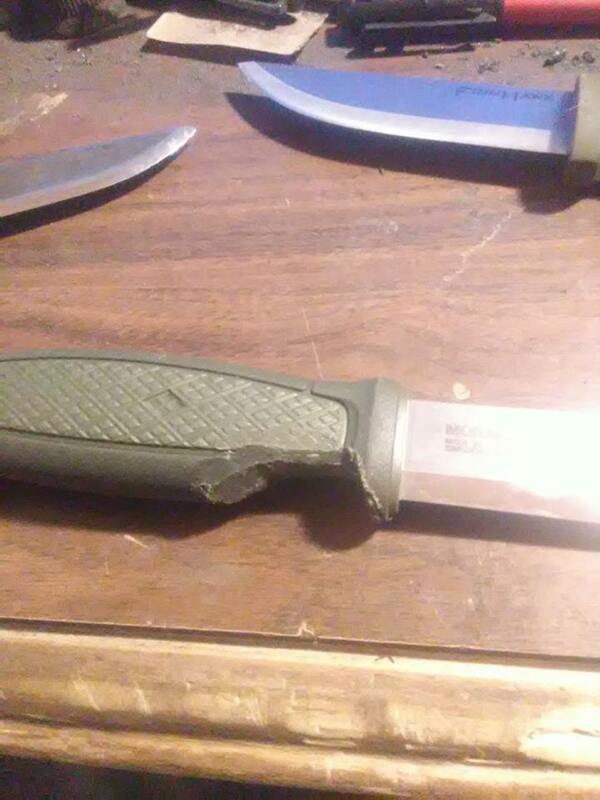 But as far as a working knife, definitely do not think this will see too many job sites with me. It seems like it might see some use in the barn for skinning and butchering, that tip seems like it would not require much resistance to snap off. And from times rummaging around in a partially frozen animal searching for a knife tip I have got to say the cuts on my fingertips and I are not a fan of this. Out of the four I would strongly recommend three, plus too they're all knives $30 and under ( the ones I recommend anyways ). 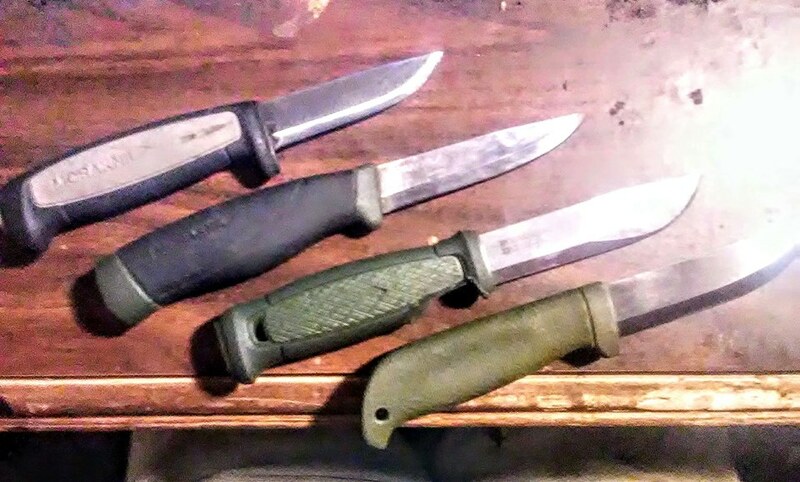 Have always been a fan of Mora, Hultafors and Cold Steel, but these three knives certainly cemented their place in my heart. Slippy, A Watchman and Joe like this. A man never truly knows how good he is with a gun until that gun is his last resort to live. Denton, Kauboy, Slippy and 3 others like this. Followed by a picture of my attempt to try and make the Kansbol more appealing for me. Missing from the picture and currently my life is my Hultafors Heavy Duty GK, it is currently in the mail on its way back to me after one of my laborers who was sending bits to be sharpened out allegedly dropped it in the one crate. I had let him use it to cut threading for securing the bundles of bits and he apparently forgot to reopen the crate. After urgently calling the company for a 12$ knife they confirmed that they had it and would be sending it back! Ah so, Confucious say; if you happy, I happy. I have some cheap knives from Home Depot; I have had a Swedish knife, and they were easy to sharpen, but they were pretty bland. That is not to say that I would not get another one; and I have had a Finnish knife too, once again pretty bland, but functional. Interesting, I would have thought that green knife's tang would be wider than that.. I assume the groove is what you mentioned, to keep the finger from sliding up the blade?